I can’t guarantee that I heard every word uttered during Tuesday night’s City Council hearing on water rates, but two words that I didn’t hear were “deferred maintenance.” Too bad, because that’s what this is mostly about. Yes, we are doing good by using less water, and yes, that paradoxically causes a cash crunch for the Water Division that means we need to pay more for the water we do use. That loss in revenues, however, only accounts for a portion of the deficits the Water Division is facing. The fundamental reason we need to raise water rates is that our system is aging and needs fixing. Even if we weren’t conserving water, rates would need to increase substantially to pay the costs of deferred maintenance. The numbers are that with only rate increases equal to inflation (the baseline), the projected loss in revenue from 2013 levels over the next six years (through fiscal year 2020) is about $14.3 million. Over the same six years, the Water Division’s capital needs are projected at about $37 million. (The data comes from the Kennedy/Jenks “Water Rate and Revenue Plan” presented to City Council this month.) If you review the Water Division’s $37 million capital budget for fiscal years 2015 through 2020 (Table 4 in the Kennedy/Jenks report) you’ll see that relatively few bucks are for special projects, like a new booster pump station. Most of the expenditures are for maintenance, such as water main replacements and similar improvements, along with routine costs like vehicles and sidewalk repairs. As has been typical with public infrastructure in America for the past 40 years, Santa Monica’s water system has been starved for maintenance because voters don’t want to pay for what they’re wearing out. Cast iron pipes are now nearing a century of use and need to be replaced. We shouldn’t be surprised. 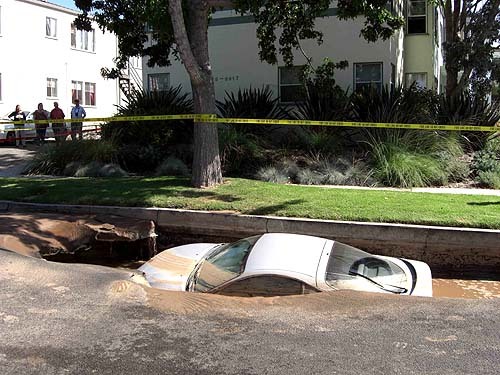 Santa Monica had a major water main break in 2002 and a serious sinkhole in 2007. Unfortunately I wasn’t surprised, watching the video of Tuesday’s hearing, to hear members of my own Baby Boomer generation complain about having to pay more, and call for a bond issue to pay for this catch-up maintenance. They said it wasn’t fair that they might have to pay for a system that future generations would use. But then we boomers have never worried about getting a cheap ride on investments preceding generations paid for, without paying to maintain them and without making investments for the future. Hey, we’ve saddled the next generation with student loan debt; why not give them some water debt, too? Speaking as one boomer, I don’t want my water rates to include interest on a bond for work that we can and should finance as we go if our rates include reasonable amounts for maintenance and replacement, and I’d like to invest reasonable amounts of money (piggybacking on state money that might be available, not to mention the settlement money the City receives from polluters) to increase our flow from wells and the reuse of gray water so that we can reduce the relatively costly (but still cheap!) water we buy from the MWD. Of course, no one likes to pay more for anything, especially for something we all take for granted. The monthly increases are going to be trivial for a middle-class family (according to Table 8 in the Kennedy/Jenks report, the increase after five years will be about $11 per month for a typical single-family house, assuming a 20% reduction in usage and the 9% annual rate increases the City Council adopted), but certainly there are low-income people for whom even a small increase would be painful. The problem is, however, that you can’t build high-quality infrastructure if one requirement is that the actual cost must be affordable to people with the lowest incomes. You need to find another way to subsidize their water, or, even better, find a way to increase their incomes. The rate increase naysayers did make some good points, however. One was that with everyone trying to reduce usage, both by investing on water-saving improvements and changing behaviors, it’s going to get harder in the future to respond to droughts by lowering consumption. This causes frustration from people who, after all, are doing the right thing. What it means, however, is that we’re going to need more investment, both public and private. In gray water systems, for instance. The good news is that if people make investments to reduce water usage, their usage will remain lower even when the drought is over, and they will not feel the full impact of higher rates. Another point I agreed with, one made by Diana Gordon from the SMCLC and others, is that the City’s goal of achieving water self-sufficiency by 2020 is artificial and should not drive any policies. The goal is admirable for both ecological and financial reasons, but it is artificial not only because of the arbitrary date, but also because “self-sufficiency” is an artificial concept. What does self-sufficiency mean when much of the City’s “own” well water doesn’t lie under Santa Monica? Even to the extent it does, the water is part of a regional pool of groundwater that is replenished by regional surface water. Santa Monica’s water needs and resources, now and in the future, are part and parcel of the water needs and resources of a still growing region. It’s artificial to think that Santa Monica could be self-sufficient in water or anything else. This entry was posted in Uncategorized and tagged Diana Gordon, Santa Monica water rates, SMCLC by Frank Gruber. Bookmark the permalink. Yesterday’s LA Times had a piece on people going to court over tiered rate structures – saying they are unconstitutional! If that holds in a court of law, it will make a mess of a lot of major efforts to encourage people to use less water. Yeah I saw that. Disturbing.